With sidewalk vending illegal in many cities across California, Sen. Ricardo Lara said Friday that a bill he is introducing would decriminalize the act statewide. 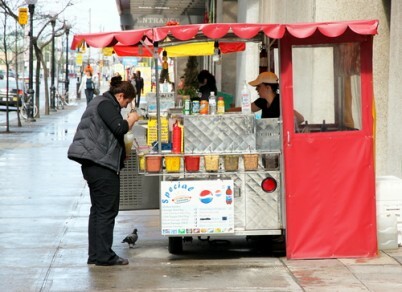 The Los Angeles City Council voted in February 2017 to stop making street vending a misdemeanor criminal charge, although it is being penalized through citations as the council works on a permit system for the industry. Lara’s bill and the City Council’s actions have been motivated in part by the fact that many sidewalk vendors are immigrants who are in the country illegally, and a criminal violation could lead to deportation. “The Safe Sidewalk Vending Act that we are introducing today protects women, seniors and immigrant entrepreneurs who are an asset to California’s economy. Sidewalk vendors are a visible part of our communities, and that makes them vulnerable to extortion by gangs, crime, persecution and even deportation …,” Lara, D-Bell Gardens, said at a news conference on the steps of Los Angeles City Hall. Lara, who was surrounded by several dozen supporters of Senate Bill 946, including members of the L.A. Street Vendor Campaign, said the bill would prohibit making sidewalk vending a crime across the state and allow local governments to regulate sidewalk vending if they create a permit process. “With Immigration and Customs Enforcement threatening to deport any undocumented immigrant, sidewalk vendors are more vulnerable now more than ever,” Lara said. Isela Gracian, president of the East L.A. Community Corporation, said the majority of cities in California criminalize sidewalk vending. Lara and some of the other speakers pointed to a recent case in San Bernardino County, where a mother of four was arrested for street vending and is now facing deportation, as a reason to amend the state’s laws. Marcelina Rios of Ontario was selling corn at a park in Rancho Cucamonga when she was arrested Oct. 13 by a sheriff’s deputy on a misdemeanor violation after receiving her fourth citation for street vending without the proper paperwork, according to the Inland Valley Daily Bulletin. When Rios was released from jail, immigration agents detained her. She is still being held at the Adelanto Detention Facility while undergoing deportation proceedings, according to her cousin, Rosalva Flores. L.A. leaders who’ve supported the efforts to decriminalize sidewalk vending while creating a permit process have said that it is the largest city in the country not to allow it.